Partnering with Irish company Salaso Health Solutions is helping one of America’s largest healthcare providers to improve outcomes for both its patients and hospitals. Salaso is an innovative technology company that produces software solutions for online care in physical rehabilitation and wellness. Its care management platform and mobile apps help patients to convert prescribed exercise routines into daily habits, boosting engagement and recovery. Since 2016, Salaso has been partnering with US-based Northwell Health to provide online care management services to stroke survivors, patients with movement disorders and other neurological conditions, as well as patients with COPD (chronic obstructive pulmonary disorder). Northwell Health is New York State’s largest health care provider with 22 hospitals, over 550 outpatient facilities, and nearly 15,000 affiliated physicians. It cares for more than two million people annually. “We’ve received great feedback from patients, extended family members and care coordinators,” said Souhel Najjar, MD, senior vice president and executive director of Northwell’s Neurology Service Line, and chair and professor of neurology at the Donald and Barbara Zucker School of Medicine at Hofstra/Northwell. Northwell is just one of a number of healthcare providers for which Salaso has devised custom-made physiotherapy programmes deliverable by app. Demand is growing, as hospitals increasingly look to digitally-enabled medical technologies to improve both patient outcomes and hospital efficiencies. “The value of exercise to enhance recovery and wellbeing is well understood. 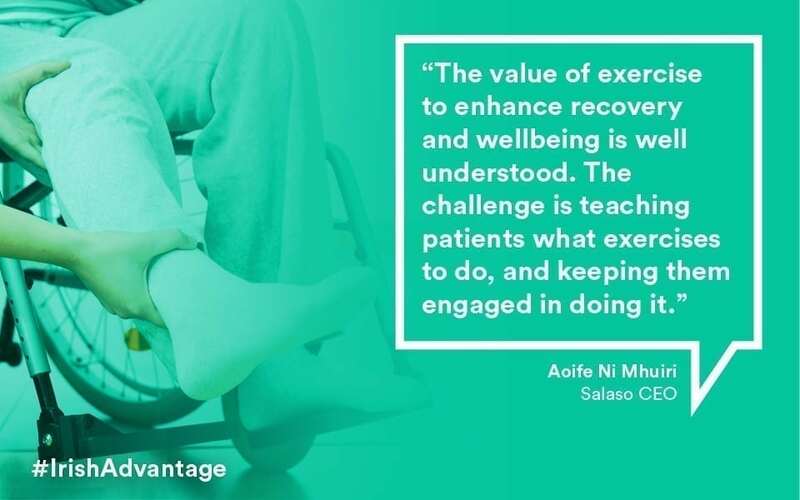 The challenge is teaching patients what exercises to do, and keeping them engaged in doing it,” said Salaso CEO, Aoife Ni Mhuiri. Research suggests that typically just 20% to 30% of patients complete their prescribed exercise programmes. This has an impact, not just on patient outcomes, but on hospitals too, particularly as, in a bid to control costs, health insurers globally are shifting from reimbursement by treatment to reimbursement by outcome. The Salaso platform makes it easy for patients to complete prescribed programmes, log their progress and reach short and long-term goals. The increased engagement also creates more touchpoints between patient and physician, making the patient more engaged in their recovery pathway. “If you can increase engagement, you will get better outcomes and reduce the need for surgery. If you do need surgery, exercise can help get patients out of hospital quicker, and reduce readmissions,” said Ni Mhuiri. Salaso helps healthcare providers to increase the reach and capacity of their services. One of its US hospital clients uses the Salaso platform to deliver therapy to up to four people at a time via the telehealth feature. The therapist remains on site at the hospital, providing real-time guidance to patients in their own homes. “The big challenge is getting patients to travel into hospital for this therapy, particularly when so much of their life is already taken up with appointments. It is often difficult to get a bus or a wheelchair accessible taxi for someone with a long-term condition like multiple sclerosis,” Says Ní Mhuirí. Salaso’s technology helps patients to get better faster, increasingly in their own homes. Enabling them to manage their own therapy is empowering too, giving patients a greater sense of control. 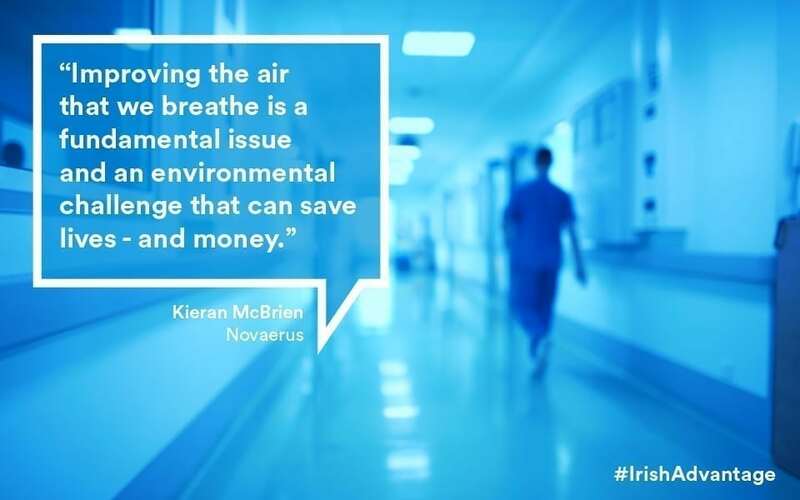 With an industry-wide move towards digital technology already gathering speed, the platform is particularly suited to the growing number of “smart” hospitals, a fact that Ní Mhuirí noted on a recent trip to Humber River Hospital in Toronto, Canada. “The hospital is completely wifi enabled, with screens beside all patient beds which are set up to allow access to entertainment and to communicate with friends and family. Each of those screens can also deliver exercises to patients, every day,” she said. In orthopaedics, Salaso’s programmes are focused on reducing the length of stay, to enable patients to return home earlier, and hospitals to reduce costs. It is also moving into the area of employee wellness programmes. “Musculoskeletal conditions place a huge burden of cost on employers, particularly in the US, where employers typically bear the cost of employee health insurance,” she said. The blend of clinical and IT skill-sets in its team allows Salaso to innovate through collaboration with clients, winning respect in the healthcare industry for the high clinical quality of its product.